letter home – march/april/may 2017. I haven’t forgotten about you! I have been both busy and not busy at the same time. How is that even possibly? In March, I joined a couple Peace Corps Volunteers (PCVs) and a Namibian friend to Cape Town, South Africa for a relaxing vacation and we also attended PRIDE. Recently, Peace Corps Namibia, with the overwhelming support of former Global Peace Corps Director, Carrie Hessler-Radelet (I met her last July), formed Diversity Resource Partners (DRP). As you can imagine, PCVs join Peace Corps during all stages in their lives. From recently college grads to retirees and many volunteers in between. Serving as a black American volunteer has its challenges, including times where I must “prove” my Americaness and ability to do things as well or even better than white Americans, of course considering my skills and knowledge. While this remains my main struggle during service, many other volunteers face challenges in being open about their religious beliefs, sexual orientation, political affiliations, etc., which can make it a very lonely place for a volunteer. We created DRP to provide a place for volunteers to connect and have a place to address these challenges and provide a sounding board in how to deal with challenges (respectfully and tastefully) in our communities (with other volunteers and our actually Namibian communities). This has definitely been the one time in my life that I have truly thought about my physical identity on a daily basis, whether people are giving me the run around because I don’t appear American enough for them, to subtleties such as watching a cashier hand a fellow volunteer their change while placing their left hand on their right elbow (a sign of respect) and that same cashier sliding my change to me on the counter, or having an HCN approach a group of volunteers and shake everyone’s hand except for mine, are moments that are hard to shake and leave a lasting impression. I can’t say most days I thought about that in the States. DRP provides a place for me to talk about these challenges so they don’t eat me up inside. I also made a trip home in March. I’m kinda regretting it now. It just made me miss home too much. I loved seeing everyone while I was home, don’t get me wrong. I also have overall enjoyed my time here, but it just makes it easier to be homesick thinking of the things I am missing out on now to be here. But, in the same ways, one year passed so quickly, I expect my last year of service to be the same. I made a Facebook post recently about things I missed in the States. Thinking back, it was such a superficial list. My best friend, Carrie Hooton, challenged me by responding, “Things I miss by not going to Namibia: (Krys fill this in, top 7)”, CHALLENGE ACCEPTED. Blog post in the works. 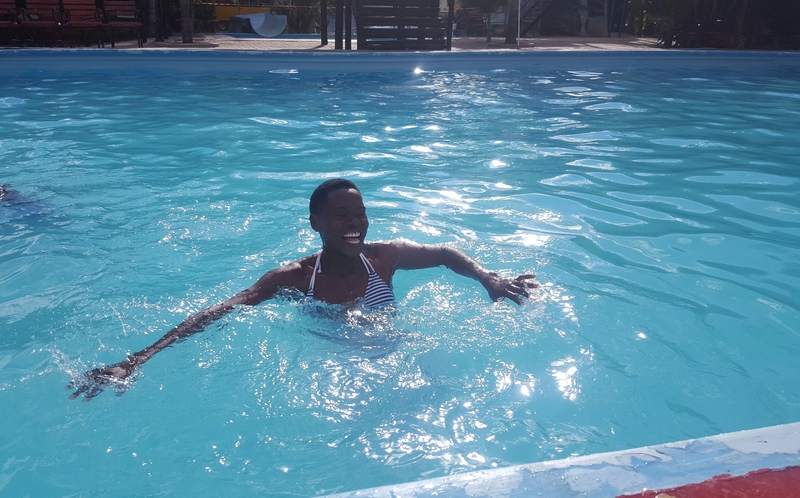 April was filled with meetings and lots of transitioning in Peace Corps Namibia. My last email I talked about struggles of the health program. All of the health volunteers were invited to Windhoek (pronounced Wind hook or Vind hook), for a 3-day conference on restructuring the program. Unfortunately, due to continuous staff changes, and lack of support and partnership with the Ministry of Health, being a health volunteer has been, I’ll just say it, HARD!!! Many of us are in clinics in rural villages where English is not spoken or spoken well. So, when a PCVs shows up, the clinics see us as if we’re creating more work, as opposed to helping to alleviate it (even though these clinics have agreed in advance to host a volunteer). So, many volunteers have to be extremely creative and flexible. From the meeting, we were able to come to a consensus of what a true health volunteers role should be and not only that, we suggested new ways recruit volunteers to Namibia because the current application was in some ways misleading. At the end of April, I was involved in the first Camp O-YEAH in my region. Because of my food science background, I was pretty much the camp cook. Josie knows, I hated food management! My food management rotation literally brought me to tears. Well, I ended up planning the menu for a 5-day health camp- including requisition, recipes, menu, and the US to metric conversions! Most meals turned out great. Campers were happy as well as the facilitators. The campers were able to try new foods that they don’t eat at home, and let’s just say, EVERYONE LOVES TACO TUESDAYS! During the month of May, the schools were on holiday. The schools here are year-round (somewhat), so there are month-long breaks during May and December. I didn’t have much planned, so the principal at the secondary school, Ms. Elago, invited me to her home for a few days. It was nice to get away for awhile. We relaxed, picked lemons from her lemon tree, and talked about projects for the upcoming term. I did make another trip to Rundu located in northeast Namibia, for the going away party of the group who arrived in Namibia a year before me. My friend, Steffi, was a business volunteer in Namibia. Recently, NPR did a fantastic reflective piece on her service, you should read it! She’s heading to NYU in the fall. Next weekend, I am heading to Victoria Falls, Zimbabwe to run a 7.5K (it was only R45~ $3.50 USD). I am probably going to bungee jump, Mom. Just be warned now. Then, later this month, my cohort group meets for our Mid-service conference, marking our one year at our sites. I hope this email blast wasn’t full of complaints. I mean, like always I take the good with the bad, and that’s normal for any job, whether it’s brewing my life away at Starbucks or roughing it while trying to balance cross-cultural interactions. Some days are good, some days are challenging. The most important thing is learning from each experience, amiright? Do I like reading? I don’t know. But, after reading some of the books I’ve read in the last year, I am convinced I could write a book about my life and sell a lot of copies. I met the Minister of Health, Dr. Bernard Haufiku. He came to the health camp and spoke with the youth. He is an intelligent man and so kind. Invited us to his house from dinner the following evening. In US terms, this was like meeting the Surgeon General of the US. I took a photo of a taxi rank, where you should haul a taxi from, but this is not the reality. I still hate hiking in this country! I have a roommate, it’s a mouse and it likes to eat my produce. Rainy season is over and everything is dry and dead, again! We harvested all of our mahangu for the year, the kids are using sticks to get the grain off of the reeds. Our dog, Brownie, had 13 puppies two weeks ago, I haven’t decided if I am keeping one yet. I passed out some bears at a local kindergarten. Bears were donated by the Mother Bear Project. If you know how to crochet or knit and want to find a way to put a smile on a child’s face, check out their website. Camp YEAH (Youth Exploring & Achieving in Health) is a health camp hosted by Peace Corps Volunteers and their counterparts in Namibia. Each year, in-school youth apply and are then invited to a week-long camp to engage in topic discussions and activities that will empower them in making healthy choices regarding their health and the health of their communities. This was the inaugural year of Camp O-YEAH (the ‘O’ stands for O-Land) which was hosted in Oshakati. 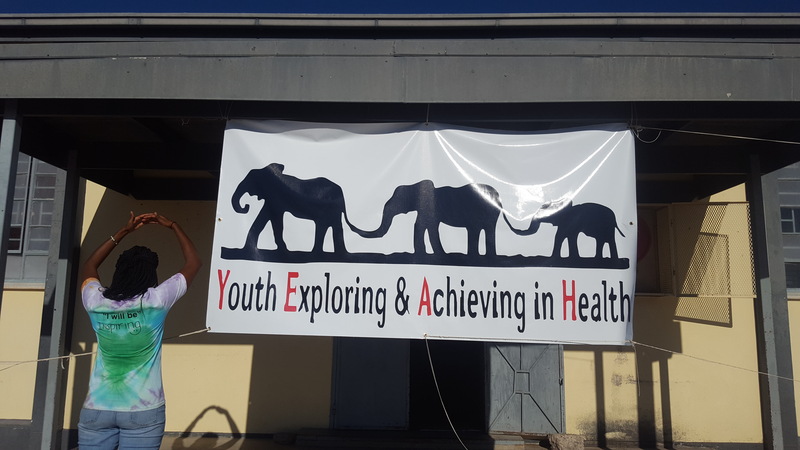 18 youth from across the four regions of O-land (Oshikoto, Oshana, Omusati, and Ohangwena regions) gathered for a week of activities involving teamwork, goal setting, and of course, health awareness and education. Victoria’s very first time in a swimming pool. This year, I was able to bring Victoria as a camper to Camp O-YEAH. Victoria is a grade 12 learner in my village. Although quiet and soft-spoken she always has a way to light up a room. She wakes up early each morning to walk 3k to school. She spends hours studying under a torch or lantern, because there is no electricity at her home. As the winter days have become shorter, this gives her less and less daylight to not only get home from school each day, but to complete her chores while continuing to make time to prioritize her studies. Victoria wants to become a tour guide when grows up and has determined the path to get there. During my service, I have asked myself many times, “Am I doing the right things the wrong way?” I’ve struggle with community “buy-in.” I’ve struggled with finding counterparts who see the bigger picture and realize it begins with smalll daily actions. Victoria has been one who sees the bigger picture. Camp O-Yeah opened up a world of possibilities for Victoria. On day 1 of Camp O-Yeah, each camper was given a dream book. They were told to decorate their books anyway they wanted to. Within their dream books, they could write anything they wanted inside— thoughts on life, studies, draw pictures or write poems— anything. Their books were for their eyes only, and campers could choose to share the contents of their books if they wished. On a few ocassions, Victoria shared a few entries of her dream book with me. The content she shared with me made me realize even moreso how beautiful and courageous this young lady is. Each day she battles many obstacles to receive an education, change her fate, and have a voice in her future. So, whether or not I ever find out if I am doing anything right during my last year of service, there is one thing I know: Victoria came into my Peace Corps service at the right time, and if in any way I am able to impact her life in a positive way, that will make all of this worth it. The Kavango River: separating Namibia from Angola. It still amazes me how different the landscapes are as you travel through Namibia. This weekend I spent some time in Rundu. I knew I was getting closer to town when I saw vivid green foliage, traces of water from recent heavy rains, and elephant crossing signs. Yes, seriously. I live in a country where elephants and people can cross paths (although, it wouldn’t be a great idea). How crazy is that? One of the many beautiful peacocks roaming around Camp YEAH over the weekend. 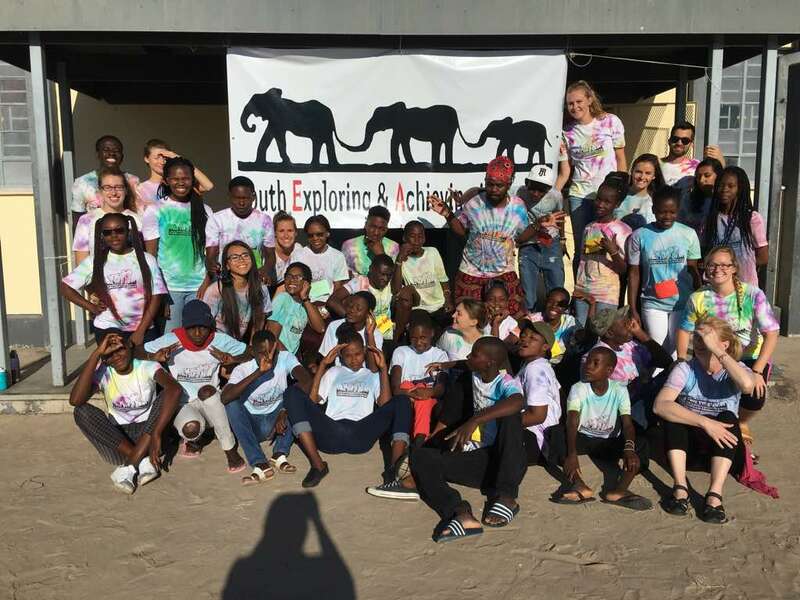 Each year volunteers in the Kavango Region host Camp YEAH. YEAH stands for Youth Exploring and Achieving in Health. The camp focuses on educating youth about the risk of HIV/AIDS and other issues affecting youth such as teen pregnancy. Volunteers and counterparts select motivated learners from their communities to participate. This year, we will be introducing this camp to Ovamboland, creatively rebranding the name to Camp O-YEAH. Camp O-YEAH will be held during the first week of May. I have been put in charge of getting all the kitchen/nutrition stuff in order for camp. Since this is my first time being on the operations side of any camp, I figured this was a great opportunity to check out Camp YEAH, but also see how a camp kitchen is run. When I completed my dietetics degree, I never thought I would use any food management concepts again. Not because I would never need to, but because I never wanted to EVER again. (Never say never, my friends!) I fell in love with the community health aspect of dietetics, and not so much with the food management or clinical side of it. Dietetic professionals know that creating menus to feed the masses takes a lot of time, math, tears, and preparation. Move to Namibia and add in converting everything from US to metric, and it turns into one heck of a good time. I watched as a team of two volunteers with the assistance of a few locals cook and serve three meals per day to approximately 50 campers and staff. I was thoroughly impressed and mostly relieved that some school kitchens in Namibia are equipped with appliances found in commercial kitchens in the States. (They had a tilt skillet, y’all). Mariah and Winnie cooked and introduced delicious new foods to the campers while reminding volunteers of the yummy foods we sacrificed for two years. For me, planning six days, 17 meals including 5 tea breaks, and 50 expected attendees will make anyone want to pull their hair out, but I think it will turn out just fine. Speaking of hair, do you like my new style? Can’t beat a new look for $10 USD.